Solution: TurboTax Estimated Taxes helps people estimate, file, and pay quarterly taxes. Intuit initially hired me as a staff UI Designer to support TurboTax Estimated Taxes (now defunct). Although I designed interaction for numerous projects while at Intuit, this project represents a large chunk of my time and effort. I conducted several usability and marketing studies from late 2006 to early 2007. Each study focussed on different aspects of the user experience ranging from SEO to help the user find the application to specific tasks a returning user wants to accomplish. Among the many learnings from this research, we found the majority of our users were elderly retirees. Users had trouble finding where the tasks lived and weren’t sure when they were done with the task. We saw high rates of abandonment during setup and initial use. First, I redesigning the setup user experience from a 14 step process to 3 steps. This substantially reduced the abandonment rate and initial confusion. Ultimately, this decreased support calls and abandonment rates. Next, I redesigned the home page with a checklist metaphor to guide users to the remaining tasks based on their needs. The checklist guided users to next steps required by the IRS, errors that must be corrected, and points of concern within their account. This further decreased confusion by giving users a clear set of objectives each quarter. Lastly, I simplified the filing process to a single screen from a 4 step process; simplified the account management and reports sections; and improved navigation and confidence within the estimated taxes calculator. The simplified workflows and design tested very well in usability, and successfully increased retention while decreasing support calls. However, the entire market of people filing estimated taxes is less than 1M in the United States. 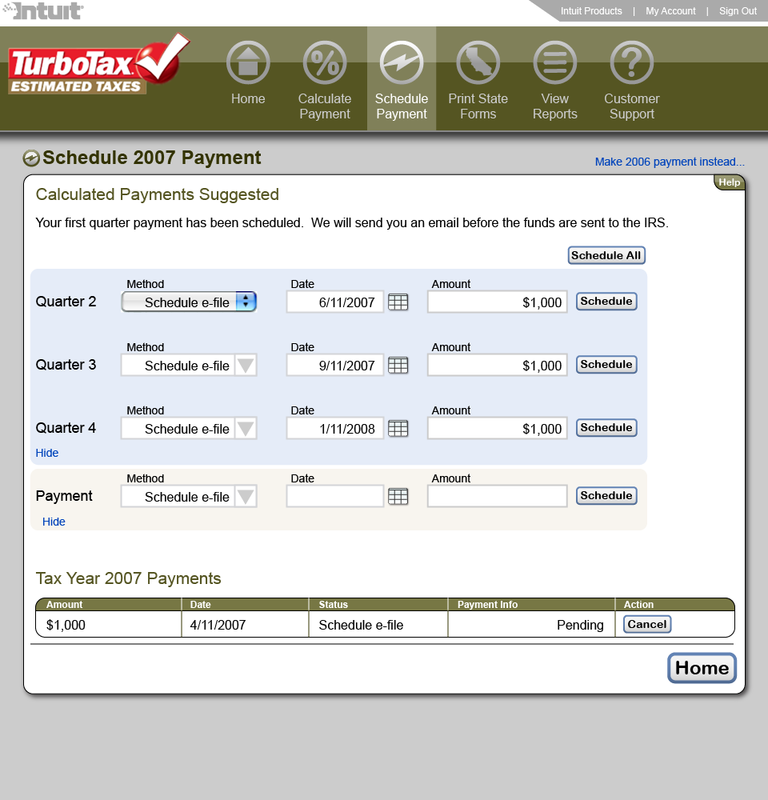 Therefore, TurboTax Estimated Taxes was discontinued in 2009 due to low adoption rates. This potential market simply didn’t translate into enough revenue for Intuit to justify the costs long-term.